The University of Michigan Department of Dance and Center For World Performance Studies, in collaboration with EXCEL and Arts In Color, is proud to present an evening with DanceWorks Chicago and the Anishinaabe Theatre Exchange. These two guest-residencies are overlapping in a night of movement and music improvisation, a DanceWorks Chicago performance, and a panel discussion regarding the topic of creating inclusive spaces in the arts. DanceWorks Chicago is committed to building a foundation for the individual artistic growth of dancers and choreographers, providing a laboratory from which early career artists propel themselves and the art form to a new level through training, collaboration, mentorship, and performance. 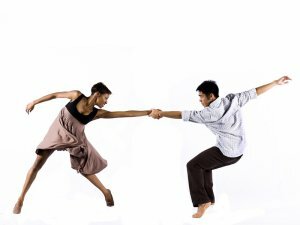 Led with integrity by Julie Nakagawa and Brendan P. Behan, DanceWorks Chicago fills a niche in the dance ecosystem investing in and shining a spotlight on the individual artists. Welcoming the public to engage with the DanceWorks family to build context around the work of art is both our pleasure and our duty as a good dance citizen. The Anishnaabe Theatre Exchange is a collaborative project using theatre to activate networks with Native communities in the Great Lakes region, and involves University of Michigan students, faculty and staff with the Cultural Department of the Chippewa Sault Ste. Marie Tribe, Lake Superior State University and Bay Mills community members.